Extremely high temperatures and toxic air pollution have caused London Mayor, Sadiq Khan, to announce a "high" pollution alert for Friday 27th July. 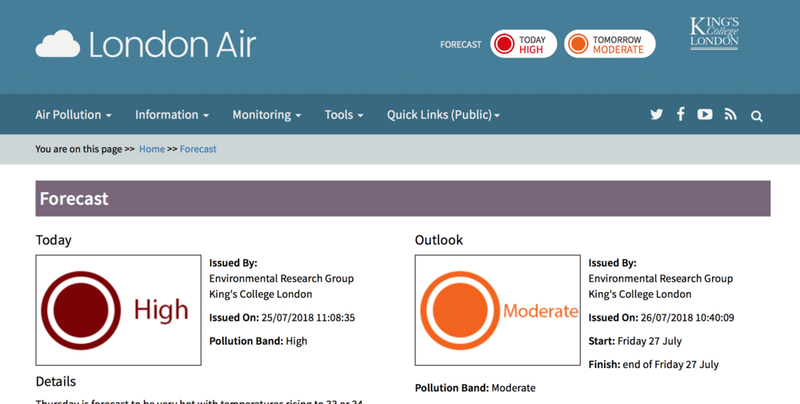 On Thursday, 26th July Mr Khan said, "The heat, combined with London's toxic air, a lack of cloud cover and emissions travelling from the continent, means I am triggering a "high" air pollution alert today, for tomorrow, under our comprehensive alert system. "This is the second time in six months, that we have had to use the "high" alert system and shows just why air pollution is a public health crisis." On Thursday the highest temperature in the UK was 34.4 degrees celsius - recorded at Heathrow. On Friday, when temperatures are predicted to rise as high as 37 degrees celsius, air quality alerts will be displayed at bus stops, river piers, on busy roads and at the entrances to London Underground stations. During periods of high pollution people are advised to reduce physical activity outdoors. This is particularly important for adults and children with lung problems and the elderly.